According to the National Fire Protection Association (NFPA), three out of every five home fire deaths result from fires in homes without smoke alarms or without working alarms. Conversely, when a home does have working smoke alarms, the risk of dying in a home fire is cut in half. worked with First Alert to develop an educational advocacy campaign infused with fun. Built around the idea of the “Super Prepared Family,” the campaign aimed to help people understand the importance of practicing fire safety and involving their whole families in the process. The overall goal of the “Super Prepared Family” campaign was to increase awareness about whole-home safety, and specifically about the benefits of installing 10-year smoke alarms during Fire Prevention Month. Our specific objectives for this campaign included driving views to the “Super Prepared Family” website content; garnering at least 150 million media impressions; securing at least 20 blog partners for a minimum of 5.5 million impressions; generating 150,000 impressions through social and digital advertising and donating a minimum of 2,000 alarms through grassroots efforts. First Alert created graphics, videos and a microsite dedicated to the “Super Prepared Family” initiative. Content provided insight into what each member of the family can do to be prepared and help keep their home and family safe. LCWA utilized these materials in a multi-media press release to launch the “Super Prepared Family” campaign, allowing these materials to be viewed, shared and downloaded. LCWA also shared fire safety tips from the campaign with TV and radio audiences via a satellite media tour. Influential mom bloggers were enlisted to further amplify the “Super Prepared Family” messages. LCWA prepared and provided targeted bloggers with customized Fire Prevention Kits that included two 10-year smoke alarms, a 10-year smoke and carbon monoxide (CO) alarm, 10-year CO alarm and a Tundra Fire Extinguishing Spray – to help protect their home. 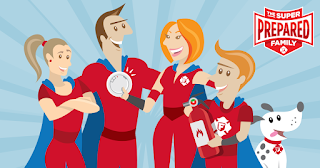 Bloggers were encouraged to install the First Alert products and share fire prevention and safety tips from the campaign with their followers in an effort to create more “super prepared” families. To spread the word about our resources with fire departments, LCWA coordinated social and digital advertising for First Alert with Firehouse, the largest fire safety trade publication. LCWA also shared graphics and content from the campaign with a proprietary list of fire service organizations. Throughout Fire Prevention Month, LCWA coordinated a variety of community outreach activities with local fire departments and advocacy organizations. First Alert and the National Volunteer Fire Council (NVFC) announced a training course collaboration for volunteer fire departments on smoke alarm installations, as well as a nationwide smoke alarm donation program. Overall, the “Super Prepared Family” campaign exceeded all objectives. LCWA secured more than 356 million media impressions and more than 526,000 impressions from social and digital advertising. 40 bloggers shared content about Fire Prevention Month and shared “Super Prepared Family” graphics. In total, the “Super Prepared Family” content was viewed more than 95,400 times, and First Alert donated nearly 4,000 alarms in October. Additionally, this campaign earned LCWA and First Alert a Silver Trumpet Award from the Publicity Club of Chicago in the Marketing category, and both a Skyline Award in the Events and Observances (more than seven days) and an Award of Excellence in Marketing Consumer Products, Packaged Goods from PRSA Chicago.